Dani from Finchbird jewellery commented on Bondville recently and ever since I have been coveting the fine, delicate designs of this husband and wife team. 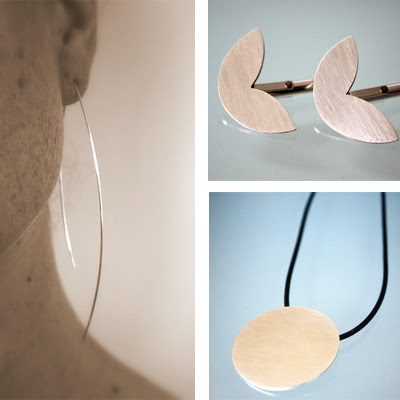 Inspired by nature, clean organic shapes, leaves and new growth, Ben and Dani Finch create handmade silver and gold jewellery including earrings, pendants, bangles and cuffs, rings and cufflinks. Oh the cufflinks. What a great, clean, modern alternative to those department store standards. I'm also quite taken with the lovely tendril earrings that are perfect in their simplicity. Based in Sydney, the Finch team collaborate on both creative and business aspects of the brand. 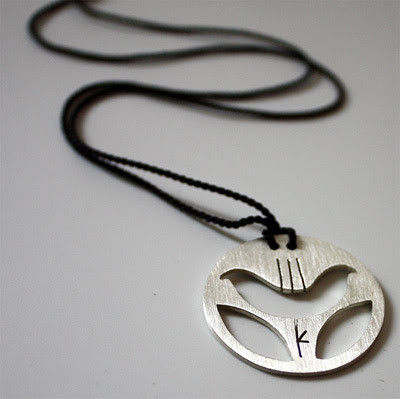 You can find Finchbird jewellery on Etsy. Check out new jewellery designs on the Finchbird blog and on Flickr and keep up-to-date with the Facebook Fanpage. Wonderful to see the lovely Dani featured here! Her store has so many fabulous designs. Hi Natalia - thanks so much for stopping by. I'm glad you like Dani and Ben's work - super talented! Thank you for the fabulous feature Steph! I have sipped many a mug of tea whilst browsing your blog and it is so exciting to see finchbird here in such incredible company! Dani you are most welcome, and I'm thrilled to hear that you are a regular reader; thank you so much for your support. As a bit of a jewellery connoisseur myself I am absolutely fascinated and thrilled with the amount of original designs that are becoming increasingly more available because of the world-shrinking ability of the internet. Your blog has proven to be an absolute treasure trove of information Steph, and I am really enjoying all the priceless information and links that I've been finding here.